You know the problem – the loading space inside your van is simply not sufficient for all the goods you need in your job. So you need a roof rack to securely store long materials such as pipes, cables or even ladders. Whether you’re driving a small or a big transporter, the challenge is there every day. 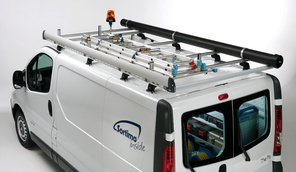 So we at Sortimo wanted to create more space for your payload by adding an intelligent roof rack system to our product range. The roof rack offers lots of extra room for your transporting needs on the vehicle roof. It also offers comfort and safety – even in extreme traffic situations. The very variable, lightweight construction of the TopSystem guarantees excellent carrying capacities at a low net weight. Compared to steel roof racks, the loading capacity can be increased according to your needs. It is made of anodised aluminium and high density stainless steel, meaning that it is corrosion resistant and offers a long service life. The TopSystem is easy to install on the vehicle. Everything has been thought through to the smallest detail – perfection made by Sortimo.